Freshwater modules are used for convenient and hygienic DHW heating according to the instantaneous water heater principle. In contrast to conventional DHW cylinders, the drinking water is not used for storing thermal energy but instead is only heated when required, by means of a powerful plate heat exchanger. The energy for this DHW heating is drawn from a heating water buffer cylinder, which can be heated by a wide range of systems – by solar thermal systems, or by solid fuel boilers, conventional oil/gas boilers, heat pumps or other systems. The Vitotrans 353 Freshwater module for DHW heating using the instantaneous water heater principle; draw-off rate up to 68 l/min depending on type. 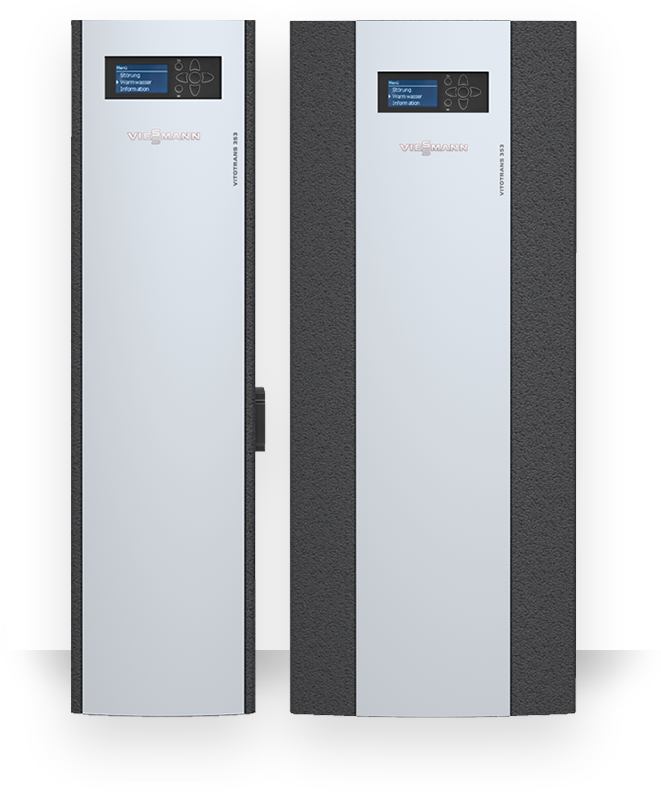 The Vitotrans 353 freshwater modules are outstanding when used in combination with a solar thermal system. The excellent cooling of the heating water by the plate heat exchanger in the Vitotrans 353 increases the efficiency of the solar circuit, because the cold return allows the average temperature of the solar circuit to be lowered. The Vitotrans range of freshwater modules are designed to ensure a constant outlet temperature at the hot water tap at different dispensing volumes. The latest highly efficient circulating pumps are speed-controlled by an integrated control so that the heating water volume flow is optimally adjusted to the current tap output. The Vitotrans range offers perfect comfort, optimal hygiene and a future-oriented energy-saving operation. There are five different types within the range. The basic version, designed for wall mounting, includes the types PBS (tap capacity 25 l / min), PBM (tap capacity 48 l / min) and PBL (tap capacity 68 l / min).